Shabby Apple is an online retailer of clothing & accessories. They carry beautiful & breathtaking womens' & vintage dresses, jewelry, swim, kids, wedding & fitness items. There are numerous, fun ways to interact with Shabby Apple! No sure what styles would look best on you? Try the Fit-To-Flatter quiz, which will let you know which dresses would best fit your figure. Play Buyer-For-A-Day, where you decide if an item is a "purchase" or a "pass". Read the Shabby Apple Blog. Follow Shabby Apple on Facebook or Twitter. Read about their Charity, which helps women worldwide! 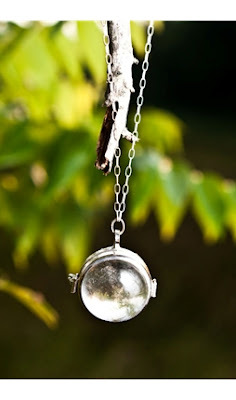 I am proud to be able to give away a wonderful Shabby Apple necklace. This piece, called "Through The Looking Glass", is a round glass bauble pendant with a side hinge that opens like a locket. The necklace is 24" sterling silver. The glass has a fish-eye magnifying effect & the interior accommodates objects up to 4mm thick. Think of what you could put in there! Perhaps a photo, dried flower or charm? Through The Looking Glass Necklace retails for $66. Come back on October 14th - that's when the Harvest Halloween Blog Hop starts! Just fill out the simple Rafflecopter form below for your chance to win! I have an oops....in the original entry I put my GFC rather than dashboard as when you follow your provided link....sorry I follow both.